Amaebi, or spot prawns, are cold water northern shrimp known and named for their sweet taste. They are the only species of shrimp which are best enjoyed raw, as cooking them will rob them of their full sweetness. 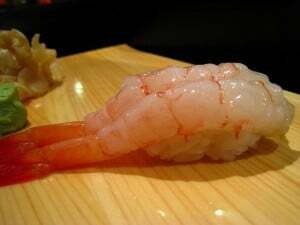 They are served on nigiri-zushi, or fingers of sushi rice, and often accompanied by their fried shells and heads. Amaebi are native to the Canadian Pacific, and are an abundant and fertile species. For those concerned about the sustainability of their sushi, Seafood Watch rates Canadian Pacific Amaebi as a best choice (and the U.S. pacific species as a good alternative). These creatures are hermaphrodites, meaning that they spend the first stage of their lives as males before turning into females- unless of course they are scooped up and sold at your local sushi restaurant before they get the chance! Amaebi are caught in their small, male state, as they are at the peak of sweetness early on in their life cycle. Because these sweet shrimp are so small, they are often served two at a time. The only time that Amaebi are best served cooked in Japanese cuisine is in their female form while bearing eggs, as the eggs lend a rich flavor to the dish. Healthy Amaebi are clear and translucent. If they are turning pink and their tails are curling into their bodies, they are not as fresh as they should be. When purchasing Amaebi, look for blackness in the head as a warning sign that the meat is losing its firmness. The best quality Amaebi will have little to no black spotting. The flavor of sweet shrimp is exactly as the name implies, sweet and delicious. If you absolutely must cook your Amaebi, make sure to do this for only a short period of time, as the texture and flavors of the dish can deteriorate quickly under heat. Amaebi is served on sushi rice often accompanied by wasabi, or less frequently ginger. The head is an exotic dish often served along with the more familiar tail. When the head is served, it is fried, usually in potato starch, and can be eaten whole like soft shelled crab. Nutritionally, Amaebi are a solid choice. Amaebi are loaded with lean protein, approximately 6.3 grams of protein per piece, with a low fat content and an estimated 60 calories. Note that this is for the raw sushi, rather than the fried head which is often enjoyed as a delicacy. A couple of tips for live Amaebi. Never put live Amaebi under tap water, as the creatures will die when exposed to the chlorine of tap water. If you are using live Amaebi, never leave them for over a few hours as they deteriorate exponentially when left. Amaebi is a great choice for nutrition, sustainability, and taste. Even those new to sushi will find it difficult to resist the temptation of sweet shrimp!